Content management systems: Everyone with a website has one, and many businesses need a better one. There are new CMS platforms being introduced into the market every few months, and the price range is so wide, it almost doesn’t make sense. So how do you make an informed decision about which platform is right for your organization’s website? But it isn’t just about reading reviews of different platforms out there and hoping for the best. It’s about figuring out which type of CMS platform will best serve your needs first. There are a lot of options out there after all, including custom, decoupled/headless, and off-the-shelf templates. Remember, the purpose of your platform is really about your content. The goal is to find a way to ease your workflows and user experience, be sure your website is secure, and have a system that is prepared to grow with your business. Let’s begin by taking a brief look at the history of content management before we talk about its future and some key features that are necessary for the best systems possible. From the time the World Wide Web came to be to present day, website owners and operators have adapted their methods of changing their content to the technology available to them. In the early to late 1990s, most websites were static HTML. Site owners would duplicate HTML pages, link them together, and build out websites with thousands of documents. Advanced tasks such as searching were typically performed server-side with available software. Contact pages and other interactive features were made possible via CGI scripts. For the most part, interactivity was rare. If a site had users log in, it probably did so via .htaccess or server-side authentication. Then came the content management system. From 2001-2005, CMS platforms such as WordPress, Drupal, Joomla, and others began their ascent from small, open-source projects to some of the most widely recognized platforms in the world. A content management system should allow administrators to add, edit, and organize content and distribute it to a multitude of platforms, not just the website front end. A truly good CMS also has workflows such as approvals, editing, and multiuser creation of content; definitions of specific types of content; and user permissions and security. This is the formula that every CMS falls into: content creation, organization, and distribution. The headless or decoupled CMS is an entirely new way of looking at content management and online website frameworks. As always, with the evolution of technology come more advantages and this type of CMS has quite a few! The number one advantage is security. Being able to separate your control and logic layers means that your administrative control center can be locked down to extreme levels. And best of all, how you publish your content can be secured according to your individual needs as well. Some other advantages are scalability, front-end technological flexibility, unique user experiences, and so on. But a particularly notable benefit is the lifespan of a decoupled CMS. 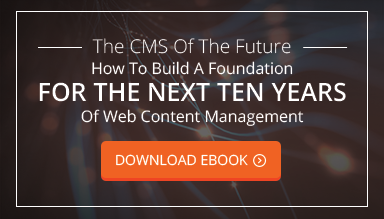 The average lifespan of a custom CMS is over five years! It’s feasible because back-end technology moves at a different pace than front-end technology. And you should use this to your advantage to build a solid technical framework for your company’s online presence. While we have just given you great information on the direction content management is headed in, this post really covers the CMS of the future from a top-level view. For a deeper dive into the history, benefits, pricing, and more, download our latest free ebook below!